Design flair is something that energetically bursts into your conscience upon walking into Soho’s Ham Yard hotel. From intriguing art work, that you can’t help but stare at, to gorgeous cosy rooms hidden away from the bustle of the main restaurants, the hotel is a visual experience in every way. 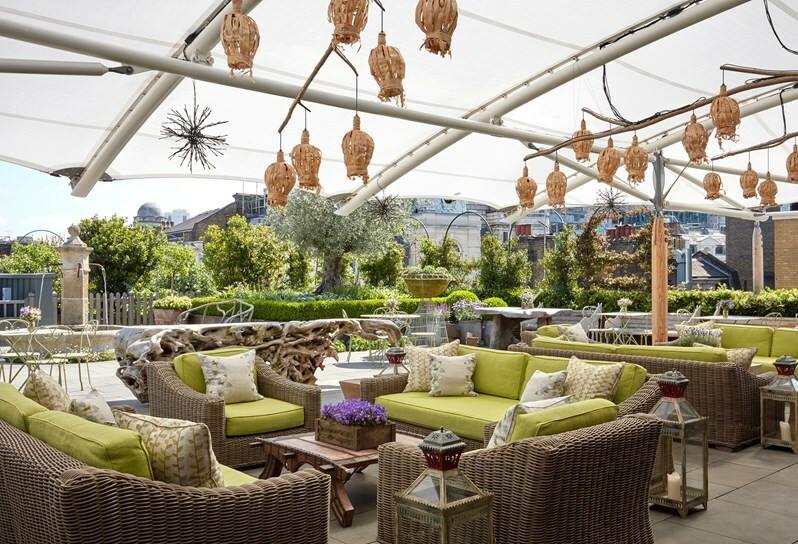 The Ham Yard Hotel occupies a large courtyard tucked away in the middle of Soho. In a sprawling U-shaped structure, containing 91 rooms and suites, the building encloses a little courtyard which features shops and restaurants. It’s a bustling hub when I set foot in it on a Saturday night. 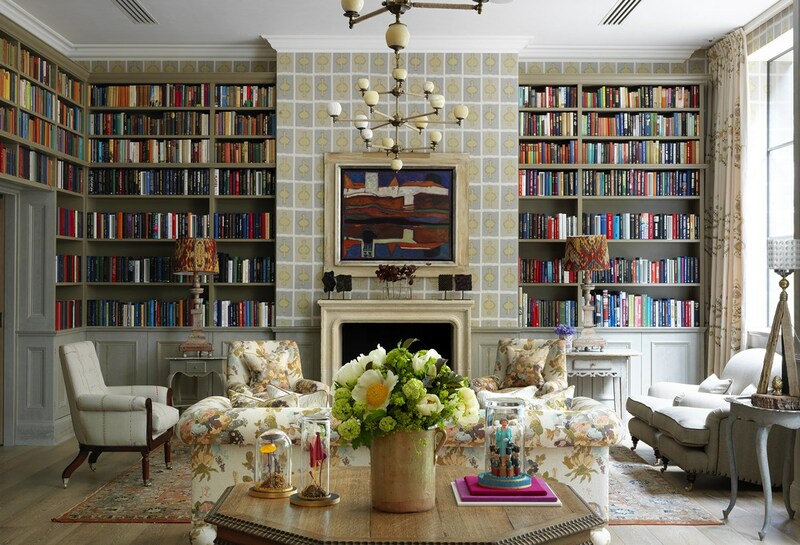 Every Firmdale hotel has quintessentially British vibe to it. Owner and designer Kit Kemp has the incredible ability of adding both charm and style to each room and suite, whilst also keeping them all entirely different. 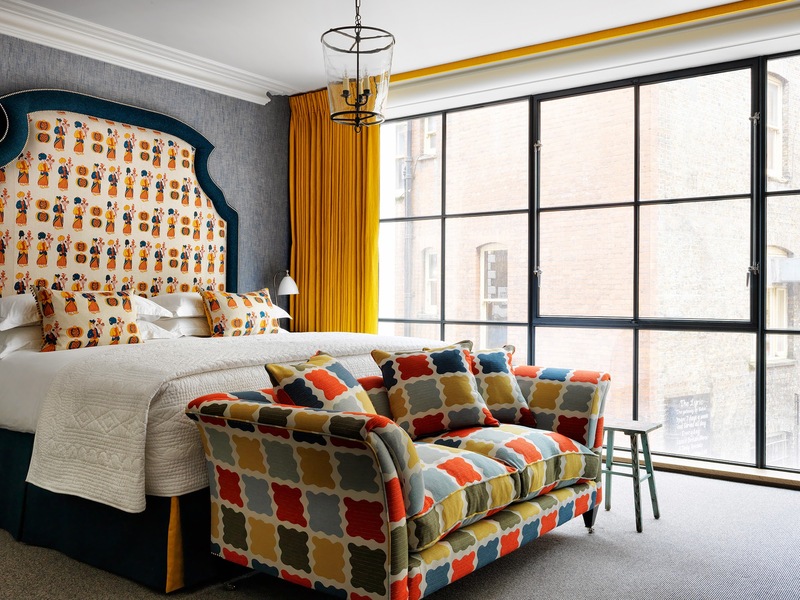 From a floral headboard to a graphic textured sofa, the rooms are awash with colour and vibrancy. Upon touching the wall in my suite, which becomes a natural instinct in one of Kemp’s rooms, I realised that the ‘wallpaper’ was actually plush cushioned material. It bounces back upon a gentle touch. The suite features a comfy seating area, where you can curl up and read a book and sip a gin and tonic from the hidden-away minibar. The bathroom is also something special. Featuring a television above the bath (complete with waterproof remote control) I had the longest and probably the best soak of my life in there before bed. Despite the size, the Ham Yard doesn’t feel manufactured, or that you are just a number in an expanse of identical rooms. Each corridor feels fresh and unique, and wandering around is an explorative journey. We had afternoon tea in The Library — just to the right of the hotel’s reception desk — and the decor is fascinating. Every piece of artwork, sculpture, furniture, and carpeting tells it’s own unique story. The burgeoning bookcases contain everything from autobiographies to travel inspiration, and you really could get lost in there for hours. Hidden away through an almost secret door in the bookcase is a 24-hour honesty bar, where guests can help themselves to cocktails and midnight snacks. Not many hotels in London can claim to have their own bowling alley. Awash with bold colours and graphic designs, not to mention the bowlers, the four-lane Croc Bowling Alley tucked down on a basement floor in the Ham Yard is full of energy. This is open to both hotel guests and visitors, and it is definitely a must-visit. The roof terrace is also a real treat. Tucked away, yet also offering sprawling views of the hustle and bustle of Soho, the balance is perfect. I explored the little vegetable garden up there, complete with little chili trees and plantings of rainbow chard. If you are looking for a beautiful retreat with both a quirky charm and a lively atmosphere, then the Ham Yard is the place for you.